I have tried wearing this on different occasions, and I can’t help but fall in love with this breastfeeding cover more and more each time. The Blissful Trenders Multi-Use Cover is so multi-functional which is why I always carry it around. Honestly, if you want to jazz up what you’re wearing without sacrificing comfort, go for it! Coming from simple and humble roots in the Philippines, Jezreel Cruz experienced the struggle of poverty growing up. With some help, she was able to attend college and earn her nursing degree in 2001. 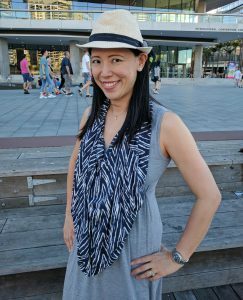 She used this opportunity to move to the US in 2005 to pursue opportunities in nursing. However, she was more passionate about running her own business. As such, she started Project Baby Bump. 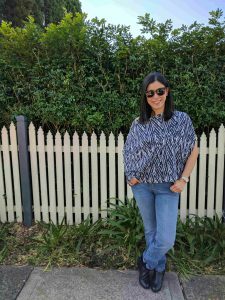 Her flair for fashion coupled with memories of shopping for maternity wear during her two pregnancies led her to the brilliant idea of transitional fashion for maternity and beyond. There weren’t much trendy or flattering pieces in the market, and so she wanted to focus on helping moms feel beautiful without sacrificing comfort. Since Project Baby Bump got so much love from her family and friends, she took her business to the next level! It was relaunched as The Blissful Trenders. It specializes in chic maternity wear for the expectant mother to fit her changing body throughout all stages of pregnancy, and even after. They even extended their product line to include children and men. You can use it as a scarf, poncho, or even one shoulder top. It just looks so beautiful and trendy! I personally love wearing it as a scarf, and poncho for cooler weather. It’s so handy when I need to use it as a breastfeeding cover since it’s just around my neck and I don’t have to carry it around in my bag. Which means that it’s one less item in my nappy bag! Given that it can be worn in different ways, this can definitely be used whether you’re pregnant or not! While I used it with straight leg jeans, I think it’s best matched with slim jeans and you can wear it all day long. Aside from this, you can also use it as a car seat cover, high chair, or trolley cover. You can even use it as a baby swaddle. I’m always looking for products that are easy to clean and fuss free. The multi-use cover is 95% rayon and 5% spandex. With that, you just need to pop it in the washer. Machine cold wash and hang to dry. Done! Just pick the design that suits your taste and preference. Personally, I went for Navy Chevron. Choose from Victoria or Tropical if you like floral prints. You can also opt for Amazon, Abstract, or Aztec for funky prints. If you choose to wear it as a one shoulder top, you can even pair it up with a belt! There is just so much to love about The Blissful Trenders! When you purchase from The Blissful Trenders, $1 of your purchase will help to give impoverished children the opportunity to have a better tomorrow through education. Follow The Blissful Trenders on Facebook and on Instagram @theblissfultrenders. This entry was posted in Breastfeeding Clothes and Accessories, Product Reviews and tagged bestnursingcovers, blissfultrendersmultiusecover, blissfultrendersmultiusecoverreview, blissfultrendersreview, breastfeedingcover, nursingcover, nursingscarf.